Activist. Political phenom. And now bona fide social and traditional media star. Freshman Democratic Rep. Alexandria Ocasio-Cortez (D-NY) added to her resume again this week after her appearance on "The Late Show with Stephen Colbert" delivered a massive ratings bump to match its best audience for a Monday ever. Then the "Late Show" posted clips of her exchanges with its host on YouTube. They went viral, racking up millions of views and getting picked up by left- and right-leaning news media. Meanwhile, Ocasio-Cortez’s already-very-large following on social media is growing rapidly. On Twitter, she has attracted 2.64 million followers, up from 1.54 million in December. Less than six months ago, that number was just 60,000. On Instagram, she has amassed more followers – 2.05 million – than any brand in the Fortune 10 except for Apple. Amazon and Wal-Mart both have 1.5 million. It’d be easy to write off Ocasio-Cortez as a flash in the pan, even after she knocked off well-established incumbent Joe Crowley in her district’s Democratic primary last year. Just 28 years old and the youngest woman to serve in Congress, Ocasio-Cortez is also a modern Cinderella story, having worked as a bartender in Manhattan when she decided to run against Crowley. But why has Ocasio-Cortez emerged as the freshman face of the just-sworn-in Democratic House? Public affairs pros say she is first and foremost a savvy communicator. 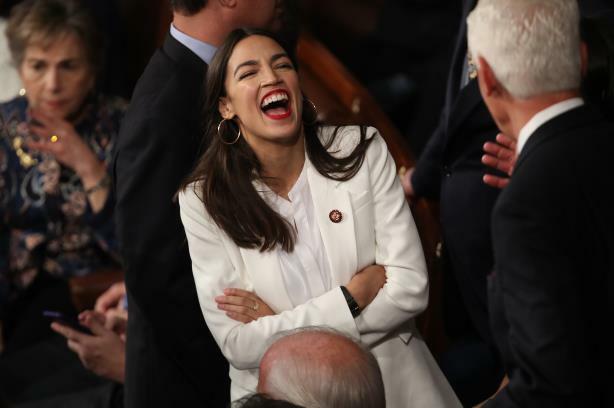 Wyeth Ruthven, VP of public affairs in MSLGroup’s Washington, DC, office, says Ocasio-Cortez is "proving the adage that social media is just that – a social medium." More than that, he applauds her messaging and ability to engage millennials and help them make sense of the broken political system. "It is a cliché to compare Congress to high school, with cliques and nerds and bullies and class clowns. Ocasio-Cortez has taken that cliché and updated it for a millennial audience," says Ruthven. "During freshman orientation, she compared Congress to Hogwarts, full of arcane rules, mystifying rituals, and very high stakes. By sharing a glimpse inside this world, she has created compelling content for her followers." And she’s done so at a pivotal time, Ruthven adds. "It's been extremely watchable, especially during a government shutdown when most people want to understand what Congress is doing," he says. "They want to see elected representatives who can empathize with people who are hurting." Other experts agree that showing her personality and weaving in personal anecdotes is what makes Ocasio-Cortez so good on social channels, but they say it is her willingness to take some aggressive stances on pressing issues that makes her a true newsmaker and political force. "She is willing to stake out positions and give a clear point of view. People have a sense of who she is and what she stands for, and so she is able to generate news and political dialogue around her," says Eric Sedler, managing partner and founder of Kivvit. "She has an aggressiveness and feistiness, while at the time same being able to be human and vulnerable." This month, she called for a 70% marginal tax rate on Americans earning more than $10 million per year. At an event celebrating Martin Luther King Jr. Day in New York, she said that "a system that allows billionaires to exist alongside extreme poverty is immoral," adding that there are "parts of Alabama where people are still getting ringworm because they don't have access to public health." Polls have shown support for her tax-rate idea, which is being chatted about as far away as the Swiss Alps, where the World Economic Forum is taking place in Davos. Ocasio-Cortez has also made clear her belief that climate change has to be addressed with bold solutions regardless of cost. Speaking to journalist Ta-Nehisi Coates at an event on Monday, the young lawmaker said: "The world is gonna end in 12 years if we don’t address climate change and your biggest issue is how are we gonna pay for it?" "It remains an open question if all this attention will all translate into her actually being able to create viable coalitions to advance public policy," concludes Sedler. "We shouldn’t expect to see evidence of that immediately, but I think that is what people will be watching to see if she can do as she develops as a Congresswoman." "The takeaway for corporate brands is to focus on a few key traits and reinforce them consistently – and constantly," says Ruthven, just like Ocasio-Cortez has done with income inequality and climate change. "[Others] will be rewarded with brand loyalty. AOC's brand is personable, relatable, comfortable among her friends, and indomitable with her opponents." "Ocasio-Cortez has succeeded by balancing the three necessary legs of the stool: a message resonant with the times, distribution via a new medium and style, and herself as a credible messenger," says Andrew Bleeker, president and founder of Bully Pulpit Interactive. "Attempts for brands or other officials to mimic her tactics will fail without the other two legs. Leaders need to find styles appropriate for their own messages and story." "AOC’s message works because it’s real," says Anthony DeAngelo, director in the Washington, DC, office of APCO Worldwide. "It’s delivered with a voice that doesn’t sound like Washington and it runs counter to what so many expect to come from politicians today. Not every politician is an AOC; their brand and their voice may not be readymade for viral tweets and Instagram stories, but that doesn’t mean they can’t break through in today’s environment."